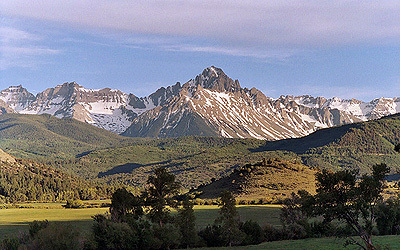 Welcome to Ridgway Colorado, located in Ouray County just south of Montrose in beautiful Southwest Colorado. Ridgway Colorado, nestled in the valley between the Cimarron and Sneffles ranges of the San Juan Mountains, has been transformed into a twenty-first century gold rush. No matter where you choose to live in our part of Ouray County, you'll never be far from needed services. Ouray and Ridgway Colorado have excellent schools, banking facilities and grocery stores. There may be just one stop light, but there are lots of reasons to stop and stay! We invite you to contact United Country Sneffels Realty, LLC specializes helping you find your freedom. We specialize in helping our friends buy and sell real estate in Ridgway, Ouray, Telluride and the surrounding areas of Southwest Colorado. We offer a fine selection of homes for sale, farms and ranches, mountain property, recreational land and businesses for sale.